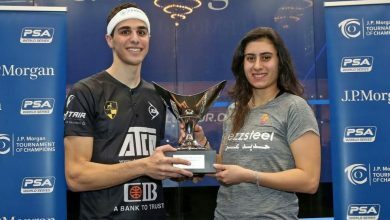 Top seeds Egypt and England will contest Saturday’s final of the JSW SDAT WSF World Cup after contrasting successes in today’s semi-finals of the World Squash Federation mixed team championship at the Express Avenue Mall in Chennai, India. Underdog Raneem El Weleily pulled off one of the best wins of her career when she defeated the mighty former world champion Rachael Grinham in the first semi between favourites Egypt and third seeds Australia. Cairo’s flamboyant Ramy Ashour, the world No2, had put Egypt ahead with an 11-5, 11-3, 11-8 victory in 44 minutes over the Australian number one Cameron Pilley, the world No14, on the all-glass show court sited in the central atrium of the largest shopping complex in southern India. 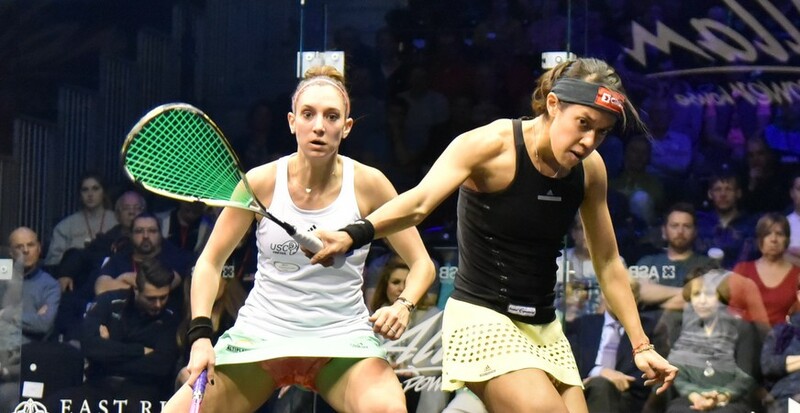 El Weleily twice came from behind to beat Grinham, the world No3, 4-11, 11-9, 7-11, 11-8, 12-10 in 51 minutes to celebrate her first ever win over the 34-year-old who topped the world rankings for 16 months. The world No12 is the lone woman in the Egyptian squad following the eve-of-event withdrawal of Nour El Tayeb, the 18-year-old world No21 who is suffering with chicken pox. “Nour so wanted to be with us – she was even hoping to come after the start,” added El Weleily. “I thought it would be really hard on my own, there was a lot of pressure – but playing Nicol (David) in the first match perhaps helped, as I could get that out of the way. Amir Wagih, the Egyptian team coach, was full of praise for his star woman: “I’m very happy for Raneem – she is very talented and very gifted. She plays at a higher level than her ranking. This match will give her a lot of confidence for the final. “Rachael is one of the greatest players. I said to Raneem before the fifth ‘I want you to believe you can do it’. In the best-of-three ‘dead’ rubber that followed, world No3 Karim Darwish beat Tasmanian Aaron Frankcomb 11-8, 9-11, 11-5 to give Egypt maximum points. England had a shock in their later semi against fifth seeds Malaysia when world No2 Jenny Duncalf was forced to retire injured in her match against Low Wee Wern after just three games. James Willstrop, the England number one ranked four in the world, had put the title-holders ahead earlier after comfortably beating Malaysia’s Muhd Asyraf Azan, ranked 57 places lower, 11-7, 11-3, 11-1. Duncalf, who boasts an unbeaten record against Low Wee Wern, dropped the first two games against her thirteenth-ranked opponent – but the 28-year-old Englishwoman battled back to reduce the deficit in the third game. After the usual between-games break, Duncalf then shook hands with the Malaysian, telling Tournament Director Major Maniam that she had a slight groin injury and was conceding so as not to aggravate the injury further. But there were beams of delight from the 20-year-old Malaysian who had beaten the world’s second best player for the first time. “I’d never even taken a game off her,” said the jubilant Wee Wern. There were sighs of relief from the England camp shortly afterwards when the second seeds clinched their place in the final after Peter Barker beat Malaysian No3 Choong Kam Hing 11-1, 11-4, 11-4 in just 19 minutes. England coach Chris Robertson was pleased with his team’s performance: “But the bigger picture is tomorrow. The minimum was to make the final, and that’s now been achieved. “But we believe we can win it – and that’s a reasonable goal. James was really good today and Jenny is No2 in the world. And Peter is a fierce competitor. “It’s all about winning,” concluded Robertson.